Looks like India’s National Telecom backbone Bharat Sanchar Nigam Ltd (BSNL) and Pan India 3G Mobile Service provider is now working in full swing to make its operation customer friendly, few days back BSNL introduced last FIVE Call Transaction for BSNL 2G and 3G users as we shared on TelecomTalk. Now BSNL has come forward and introduced Postpaid Plan Migration / Change of Postpaid Plan facility by Just one SMS for it customers in Chennai & RoTN Circle. Now BSNL Postpaid GSM customers (2G and 3G) can change or migrate to any other postpaid tariff plan by sending SMS from their mobile number as follows. Plans eligible to change through SMS :- (1) Plan99, (2) Plan175, (3) Plan225, (4) Plan 325, (5) Plan525, (6) Plan725, (7) Plan1500. To change the Plan: Key Word is CHG followed by Plan, For example, CHG PLAN325 PLAN525 (For changing from Plan325 to Plan525). Note 1. If the request is in order, a reply message will be sent to the customer as follows: “Your request for change of PLAN from PLANXXX to PLANXXX is received. 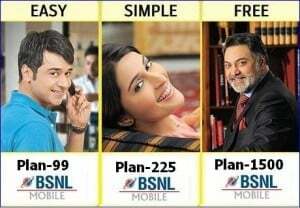 For confirmation pl send SMS PLANXXXY to 53733-BSNL MOBILE.” After getting the above reply SMS, the confirmation SMS is to be given to 53733 by the customer as described above. Note 2. If the request is not in order, a reply message will be sent to the customer as follows: “Dear Customer, Your request for change of tariff plan is regretted due to……. Pl contact on toll free 1503 or visit CSC-BSNL. After successful Plan change, an SMS will be sent to the customer as follows: “Dear Customer, Your tariff plan has been changed to PLANXXX. Thank You. – BSNL. The plan change request will be effected within 24 hrs after receipt of SMS of plan change. The customer can opt for the SMS based plan change once in a calendar month. There is no charge for change of plan through SMS.